This is a clean method of cleaning that works with a rotating brush and shampoo that whips into foam that helps reach the deeper areas of the carpet, dislodging the dust and debris inside, which are later vacuumed clean. This may however leave some residue after the cleaning so you may need to clean them with a hot / cold water cleaning afterwards. This is a cleaning method that uses a hot water cleaning solution soaking all the way inside the carpet, where it simultaneously becomes sucked away with a powerful wet vacuum. This is either done with portable machines or done in a facility. This type of cleaning is often called steam cleaning, even though it has little to do with actual steam and the temperatures involved will never reach the boiling point. weClean Professional Cleaning Solutions uses the cold water extraction method. Another popular cleaning method employed by companies, it employs a rotary brush with an absorbent pad in the middle called a shag pad, which helps remove debris and dust during the cleaning process. It can be turned over and again until both sides of the pad have been used up. This is a method using specific cleaning foam which gets applied directly onto the carpet and whipped with a powerful rotary brush, reminiscent of the bonnet cleaning mentioned above, but it works faster overall. This is also a method that requires less drying after you’re done with the cleaning job. 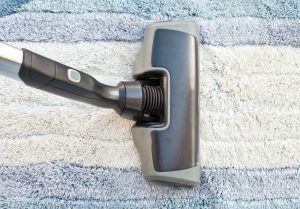 This final method employs the sprinkling of a highly absorbent compound that gets worked into the fibers of the carpet, and then vacuumed after about an hour alongside any debris and dust as well. It is a quick and easy method of cleaning that requires a small amount of time, best employed where you need things done within a certain time frame, making it ideal for businesses that want it done fast and without a hitch. Some or the articles posted on our blog are from 3rd party sources, weClean Professional Cleaning Solutions cannot be held responsible for any damaged caused by using the methods posted here. Always consult a professional if you are unsure about how to clean carpets, rugs and upholstery.